Sunderland boss Jack Ross says it is "nonsensical" that suspended midfielder Max Power is not allowed to play in the Checkatrade Trophy - despite games in the competition not counting towards his three-match ban. The 25-year-old was sent off during Saturday's League One draw with Oxford, triggering a three-game suspension. But Sunderland say they have been told that Power will not be able to play in Tuesday's tie against Stoke City Under-21s, with Ross claiming the Black Cats have been "unfairly penalised". Ross told the club website: "We felt the initial decision to send Max off was harsh. However, it has been heard fairly, and we have to accept the Football Association's decision regarding the card. "What I cannot accept, however, is that Max is banned from playing in tonight's game, yet this does not count as part of his three-game suspension. It's absolutely nonsensical and I'm sure everyone would agree with me on that. "We have been unfairly penalised with what is actually a four-game ban for our player, not a three-game ban as the rules state and I cannot understand how that can be the case." 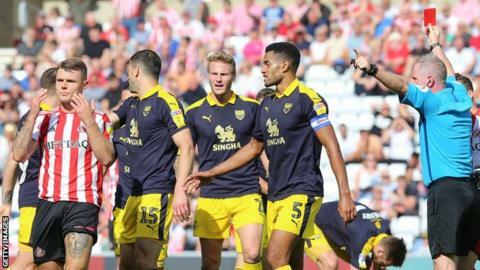 Facing a similar scenario, Southend boss Chris Powell said it was "bizarre" suspended pair Michael Kightly and Mark Oxley are not allowed to play in the EFL Trophy against Cambridge after they were both shown red cards on Saturday. Under FA rules a straight red card, which is deemed as a serious offence, carries a three-match ban from 'club football'. The EFL Trophy is a first-team competition that has separate disciplinary rules, so if a player is suspended in a league game, the tournament's matches do not count against his tally of banned games. So should an EFL Trophy game fall within the period where the player is banned, he will still be under suspension for the Trophy game as he is deemed not to have completed his ban.